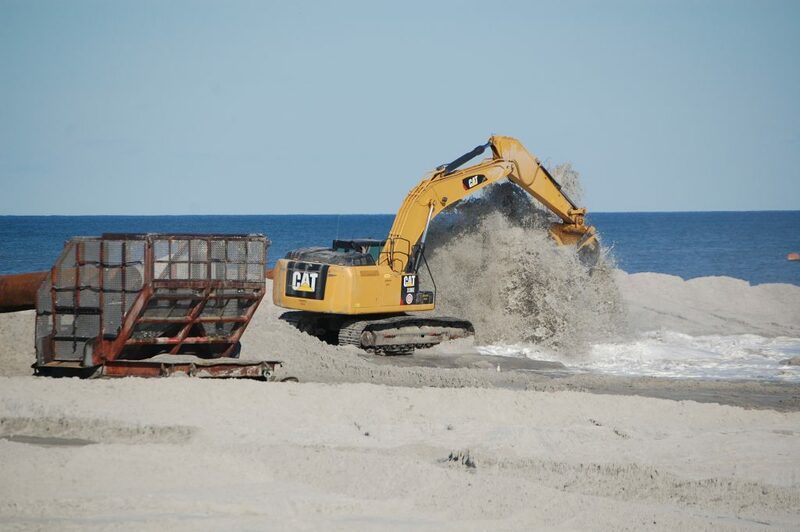 Toms River officials say despite a recent revelation that a beach replenishment project in Ortley Beach will be delayed a second time – until May 24 – activity surrounding the project has already begun and should be visible later this week. Township Engineer Robert J. Chankalian said Tuesday that assembly of the massive pipes that carry sand from offshore sites to the beach will begin Thursday. The contractor on the project, Weeks Marine, has already set up a field office. The staging area for the project will be located on the parcel of land behind the CVS store in Seaside Heights. The land is part of Toms River Township, but owned by the Seaside Heights municipal government. A bulldozer and front loader are already on site, going through safety inspections, and surveys of the beach began about a week ago. Chankalian said the delay has numerous causes, including foul weather that kept the dredge boat at a site in Florida longer than expected. “There is also a pump repair they have to do,” Chankalian said. Though the work will begin May 24 – just in time for Memorial Day weekend – officials said only 1,000 foot segments of beachfront will be affected at a time. The project will begin at 7th Avenue and work north. “There will definitely be sections of the beach that will be open during the project,” Chankalian said.